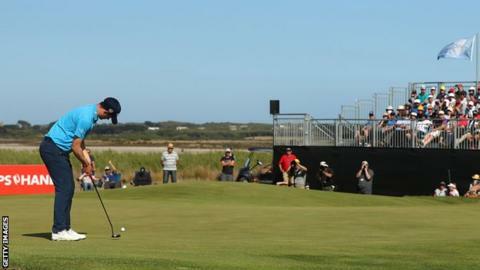 Scotland’s David Law eagled the 18th as he overcame a three-shot deficit in the final three holes to win the ISPS Handa Vic Open – a first European Tour title. Overnight leader Wade Ormsby double-bogeyed the 17th and missed an eagle putt on the 18th to force a play-off. France’s Celine Boutier won the women’s event by two shots from three players including England’s Charlotte Thomas. In the men’s event, Australian Ormsby, 38, looked to be cruising to victory but crumbled on the par-three 17th, taking five shots. Challenge Tour graduate Law said: “To have won, it sort of changes things a little bit. Brad Kennedy finished at 17 under alongside Ormsby, one shot clear of South Africa’s Justin Harding. Scotland’s David Drysdale and Australian duo Jason Scrivener and David Bransdon finished a shot further back.